Your spring river-running adventure is only a short drive away. It’s that sweet time of year when the days begin to warm, flowers bloom and the hefty snow pack in the Mountain West begins to melt, creating a whitewater wonderland begging to be explored by novices and full-time river rats alike. Soon, local rivers will swell with runoff, peaking anywhere from mid-May until mid-June, revealing a liquid playground. We are perfectly situated in Salt Lake City to take advantage of some legendary river trips in southern Utah and Idaho; all it takes is a little planning and an adventurous spirit. Whether you have one day or seven, an incredible trip can be designed with the help of numerous outfitters skilled at making the planning straightforward and seamless. These days, those with limited time can make arrangements from home and simply show up for the ride, having equipment, delicious meals and local transportation provided. The Colorado River flows through Moab in southeastern Utah, merely three-and-ahalf hours from Salt Lake City. From there, outfitters run child-friendly one to two day trips on the “daily” section of the river near Fisher Towers, with class II-III rapids. This trip is well suited for beginners and families, and it shows off exquisite red-rock scenery as you wind your way through the canyon and catch glimpses of the La Sal Mountains. A journey through Cataract Canyon, located within Canyonlands National Park, is considered one of the most spectacular river trips out there. Inaccessible by cars or roads, this is the desert Southwest in its most remote, raw and beautiful state. 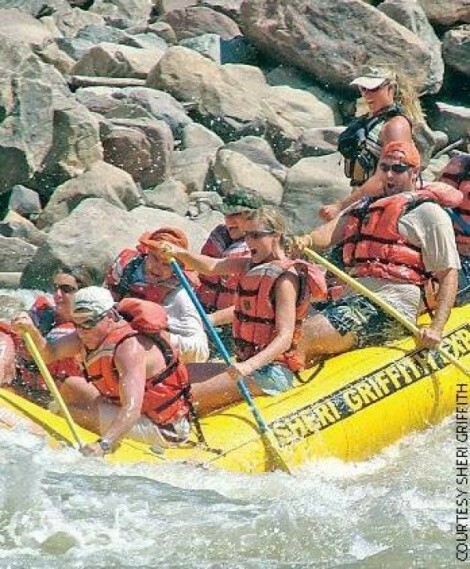 For more than 100 miles, adventure seekers first float through flat water, past the confluence of the Green and Colorado rivers, and enter a course of 28 class III-V rapids (depending on water levels) over the course of one to seven days. This is legendary white water, where the bigger rapids produce waves upward of 30 feet during high water years. Longer trips permit ample time for hiking up side canyons, viewing petroglyphs and pictographs along the canyon walls, pondering ancient American Indian ruins and rock inscriptions with the names of the earliest explorers of this route, including the 1869 John Wesley Powell expedition. This trip will leave you changed and yearning for more. Idaho’s topography differs drastically from southern Utah but is no less inspiring with its lush, green forests and deep granite gorges. On the Snake River in southern Idaho, you can meander through Hell’s Canyon, the deepest gorge in North America at an impressive 8,000 feet. Choose to venture for three to five days on the water and experience class III-IV rapids in addition to highly acclaimed fishing. With a little more time on your hands, make the trip farther north to run the Middle Fork of the Salmon River, or the Main Salmon. These trips, which can be done separately or together, vary in length from three to seven days each. Spend your afternoons crashing through class II-IV rapids, swimming in crystal-clear waters, jumping into hot springs scattered along the water, sleeping under a breathtaking starry sky and catching glimpses of a wide array of wildlife. With so many trips to choose from in some of the most pristine and beautiful lands in the West, it’s hard not to be deeply affected by such a trip on one of our many accessible rivers. New friends and experiences gained, many find themselves restored and renewed, dreaming of their next journey on the river. Get Out Get Out days water trip river one through rapids Fisher Towers ,Westwater Canyon ,Cataract Canyon ,Main Salmon.